Before meeting with liberal studies advisors, students are expected to read and review all materials provided on this website. Many CEO’s and innovators graduated with degrees in liberal studies. Liberal studies students at FVSU are broad thinkers and self-motivators who display a flexibility, adaptability, and creativity that employers seek for rapidly changing times in the twenty-first century. The rich diversity offered by the broad spectrum of knowledge areas, and the integrative thinking students deploy, prepare them for variety of opportunities in government, public service, communications, teaching, the humanities, the arts, as well as for interdisciplinary or disciplinary graduate programs. Plan your course of study with your particular goals for a career in mind. The initial paragraph you submit to liberal studies will help you understand your interests, goals, and needs . Students must consult with and work closely with an advisor. Liberal studies has six areas of concentration or emphasis. Each of these emphasis areas has a separate advisor. All emphasis areas or concentrations have different requirements, but all lead to the bachelor degree in liberal studies. Review the balance sheets and information provided on this website before speaking to an advisor. The list is currently incomplete. What about a Career in Teaching? Students often inquire whether a degree in Liberal Studies would help qualify them for a possible career in teaching. In the state of Georgia, the minimum qualification for teaching is a bachelor degree from a PSC-accepted accredited university. PSC (Professional Standards Commission). FVSU is an accredited PSC-accepted institution. There are several routes to teaching in Georgia. The easiest route is to earn a degree in the FVSU College of Education or other institution. The other routes can be to qualify for a graduate degree or to take advantage of and satisfy the requirements for alternative certification offered by the state of Georgia. Alternative, non-renewable certification is important for what are called “high needs” areas and knowledge fields that suffer a shortage of teachers, such as special education, languages, math, and science. Non-renewable certification is also offered through the Georgia TAPP program (Teacher Alternative Preparation Program). During employment at a school, the individual must complete the requirements for a renewable certificate. With a PSC-accepted accredited bachelor degree, the individual who receives a job offer to teach, may receive a Non-Renewable Non-Professional certificate provided that the school system requests it. All requirements for a professional certificate must be completed by the end of the certification period, at which time the school system will again be required to request certification for the individual. Welcome to FVSU’s Liberal Studies Program! The Liberal Studies Program provides an educational experience that is more holistic than the traditional academic disciplines and encompasses a wider range of disciplinary knowledge. At present our program is a transdisciplinary field of inquiry with the potential of being truly interdisciplinary. So what do these terms mean and how do they differ? •In transdisciplinary inquiry, the student focuses on a single topic within a broader field, such as environmental studies or creative arts, and works within designated disciplines but with the goal of providing a new perspective. and the newly created Themes concentration, in which students focus on a theme they create with an advisor to integrate the disciplines relevant to their theme. Interdisciplinary inquiry, on the other hand, integrates the methods of one or several disciplines into another, and new fields are combined, which is how bioethics and ecophilosophy came about. Though the Themes course of study has the potential of being interdisciplinary, it will not function as such until we can create a Junior-level course that will more satisfactorily teach students a liberal studies perspective and the methods of various disciplines relevant to their interests and goals. There is considerable freedom within each of these concentrations, and students should plan their course of study with their own interests in a particular career in mind. For example, in the Themes area, students may plan to enter the field of theatre and music, or aspire to enter the FVSU Master of Arts in Teaching, in which case they would need to include either math, science, or English as their major emphasis, etc. Please review all information provided on this website before making your decision and speaking with an advisor, although you are welcome to speak to an advisor at any time. 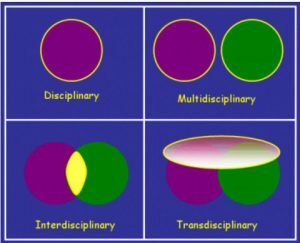 Hent.org from Australia has created a wonderful Venn diagram graphic that explains the difference between academic disciplines, multi-disciplines, transdisciplinary studies, and interdisciplinary studies. For further information that will be useful to you in your liberal studies major, please consult the website at the link above. Your goal is to reach the interdisciplinary pattern of thought.